Whenever the Browns had beaten the Pittsburgh Steelers three times in the first 10 years of the expansion era, kicker Phil Dawson has played a big role in each one of them. In the new Browns’ first victory over the Steelers, a 16-15 thriller on Nov. 14, 1999 at Three Rivers Stadium, Dawson ran onto the field at the last moment after some confusion on the sideline and, without enough time to go through his normal pre-kick routine, delivered the 39-yarder game-winner into a stiff wind as time expired. In a 23-20 triumph on Sept. 17, 2000 at Cleveland, he hit three field goals, including two unanswered in the fourth quarter that allowed the Browns to rally from a three-point deficit. 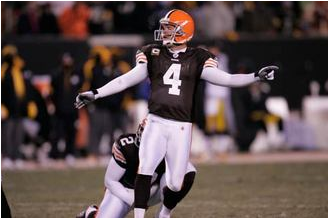 And in a 33-13 rout at Heinz Field on Oct. 5, 2003, he connected on two more field goals. So it seems only fitting, then, that the only player left in the NFL from that 1999 expansion team, should have also played a significant part in Thursday night’s 13-6 win over the Steelers at Cleveland Browns Stadium – maybe the biggest win, for a variety of reasons – the new Browns have had over their arch rivals. Dawson drilled a pair of 29-yard field goals, which was no small feat considering it was brutally cold – 15 degrees at kickoff with a minus-6 wind-chill factor – and there was a 25 mph wind out of the west-southwest that was swirling like mad once it got into the stadium, wreaking havoc on him and Pittsburgh’s Jeff Reed. “The one kick at the Dawg Pound end (in the first quarter) was really tough,” said Dawson, who, after missing five games early on with a hamstring injury, is 9-of-10 on field goals this year. The fact he made that one, and another one at the west end of the stadium halfway through the second quarter, only served to add to his satisfaction, but he still would have been happy if he had done nothing more than kick off, as long as the Browns won. For while the victory was special for everybody on the team, including head coach Eric Mangini, who helped his stead considerably as the 2-11 Browns stagger to the finish, it was even more so for the kicker because of his strong ties to the team and to the community. A dyed-in the-wool Texas guy who grew up in Texas and talks about Dallas it as if it’s the Emerald City in “The Wizard of Oz,” Dawson moved his full-time home to Westlake in Cleveland’s western suburbs because he had become so entrenched in being a Brown – not just any ol’ Brown, mind you, but someone who has seen it all since day one in this expansion era. He is, in fact, to the expansion era what Otto Graham, Dante Lavelli, Bill Willis, Marion Motley, Frank Gatski, Mac Speedie and Lou “The Toe” Groza, the last of whose records he has been chasing all along, were to the original Browns, players who became part of that first team in 1946 almost before Paul Brown had commissioned the purchase of enough footballs, shoulder pads and helmets to begin practicing. As part of that, Dawson had experienced all the losing – 43-0 in that first game back in 1999, ruining the Browns’ glorious return to the field after a three-year absence, 36-33 in the 2002 playoffs after the Browns had a 24-7 third-quarter lead and a 33-21 advantage with just four minutes left, 41-0 – in Cleveland, no less -- on Christmas Eve in 2005, turning Browns fans into a bunch of Ebenezer Scrooges, 34-7 on opening day in 2007, causing the Browns to trade starting quarterback Charlie Frye two days later, 31-28 in Pittsburgh later that year in a game that went a long way toward keeping the 10-6 Browns out of the playoffs, 31-0 in last year’s finale and then 27-14 back on Oct. 18 at Heinz Field. Going into Thursday, the Browns were 3-19 against the Steelers in the expansion era and had lost 12 straight, and Dawson had been there for every one of those miserable moments. He was in Cleveland putting up with it, trying to find a way to deal with it, long before anyone on the team now had joined the Browns. Having said all this, then, it was interesting to see Dawson’s reaction in the locker room after the game. Normally as serious and low-key as the day is long, he walked the long distance from one end of the room to the other and, upon seeing a friendly face, very uncharacteristically raised his hand as he approached from 15 feet away in a move that begged for the media person to give him a high-five. That was as close to letting it all hang out and getting wild and crazy as Dawson will ever get. He was thrilled to death, though you would have never known it. “With all due respect to the other guys in here, I don’t know how many of them understand how special it is to beat these guys,” Dawson said. “I enjoyed the few other times that we’ve beaten them, but I enjoyed this one the most. And then Phil Dawson did just that, with a little bounce in his step – and understandably so. He probably high-fived a few more people before he pulled into driveway, and maybe even a few more after that.